Fines issued to patients in England claiming free prescriptions while not eligible have doubled, figures show. NHS Business Services Authority (NHSBSA) issued 979,210 fines in 2016-17 - bringing in £13.3m - compared with 494,129 in 2015-16. Patients can be fined a maximum of £100 for obtaining free medication after an exemption certificate has expired. The British Medical Association (BMA) said those on low incomes and with long-term illnesses were often hit. The Royal Pharmaceutical Society said fines often stemmed from patients not knowing or forgetting to renew their paperwork. 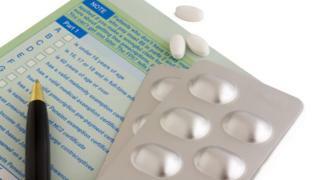 The NHSBSA said it was the patient's responsibility to ensure they were entitled to claim free-of-charge prescriptions. The health body issued £13,277,877 in fines to people in England in 2016-17, up from £8,601,349 in 2015-16. The data - obtained by the BBC under the Freedom of Information Act - has only been recorded since 2015 because responsibility for checks moved from local NHS trusts to the central NHSBSA in September 2014. Patients should present an exemption certificate and sign the back of the prescription form to say that they are exempt of any charge. The NHSBSA makes random checks when they think a claim for a free prescription has been made incorrectly. If a patient cannot prove they were entitled to claim at the time, they are liable to pay a fine of the original prescription charge, plus five times that amount up to £100. Brendan Brown, from the NHSBSA, said: "Where a patient makes a declaration on the back of the prescription form it's their responsibility to make sure that they do hold that exemption that they are declaring that they have. "Fraudulent and other mistakes... do cost the NHS millions of pounds which could be spent on frontline NHS services." England is the only country in the UK to still charge for prescriptions. The charge is currently £8.60 for each medicine or appliance dispensed. The Royal Pharmaceutical Society said pharmacists largely rely on people's honesty when dispensing medicines free-of-charge. Spokesman Neal Patel said: "What we've found is that people who've perhaps not done the correct paperwork, or their prescription exemption has run out of date because they've forgotten to renew it, those people are getting fined. "We want to spend time making sure people can use their medicines, not policing the prescription charging system." Louise Jarman, 45, from Chesterfield, has been diabetic since she was six years old and is entitled to free prescriptions, but was fined when she was told her exemption card had expired. She said: "I received a letter out of the blue saying that I have not got an exemption card or a letter saying that I get free prescription, and they were fining me £50. "I didn't know the card went out of date. They said they were fining me and I couldn't get any more prescriptions until I paid the fine. "Eventually they dropped the charge but I was told I would have to pay for my previous prescription that I'd had, and any more until my card was renewed." Dr Richard Vautrey, of the BMA, said no patient should have to pay for their care. "Fining people should be a last resort. Often those people who may be fined are probably the least able to afford to pay. "They're often people who have multiple conditions who may need regular prescriptions and that costs an awful lot of money."